Same material as "Billy Wilder, wie haben Sie's gemacht?" 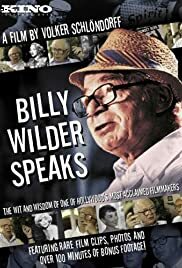 Maybe I'm crazy -- entirely possible -- but this seems to me to be identical to "Billy Wilder, wie haben Sie's gemacht?" which is another documentary containing the same interview. I'm not saying it's not edited differently or whatever - I don't know the material that well - but the interview with Wilder seemed the same. He speaks a great deal in German and tells some wonderful stories about Marilyn Monroe, Marlene Dietrich, Audrey Hepburn, the making of Sunset Boulevard and Sabrina, and the films he made about the concentration camps after the war that were shown in Germany. Wilder was a marvelous raconteur speaking in English or German, and his explanation of why he used "Isn't it Romantic" in so many Paramount films is hilarious, as are his stories of the first showing of Sunset Boulevard and trying to get Monroe to say It's me, Sugar," instead of "Sugar, it's me" in "Some Like it Hot." The stories are unforgettable, which is why I know I already heard them in "Billy Wilder, wie haben Sie's gemacht?" Well worth seeing if you're a fan of Wilder or just a film buff. He was a true genius and a lively personality.